​The Pom is the smallest memeber of the Spitz family of dogs and take their name from the province of Pomerania in Germany. They are incredibly lively, full of life little dogs, but also have a mind of their own - this little dog is no pushover. Because they are so small, it is not a good idea to leave them alone outside, especially is you live in the country as they can be perceived as prey Poms can be perceived as prey by eagles, owls, hawks and other wild animals. Unfortunately in their minds, they think they are much bigger than they are, and unless well socialized will happily try to take on much larger dogs! 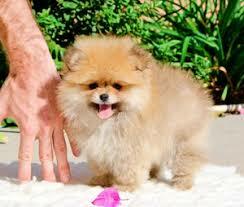 Many people think that because this is a cute breed that no puppy socialization is needed - not correct! As above they can be otherwise to other dogs if not well socialized and the same is to be said for people and tend to bark a lot. Due to this we do recommend that you teach the 'bark & shush' as a pup. Another mistake that people tend to make with the Toy breeds, is that they carry them around as much as they can - don't - they have legs that need to be used, and additionally, lifting a dog higher up, if around other dogs, can tend to make the dog being lifted reactive, as it is automatically higher up than the other dog. This is one of the breeds that is known to be hard to toilet train, so early toilet training, as with all dogs, must always be supervised. Here is a simple way to go about it, and if you crate train​ the pup in the correct manner, it really does make the process much easier, simply because dogs, in general, do not like to soil anywhere near where they sleep - the exception to this, is when pups have been kept in cages in pet shops with no separate toilet. One thing to watch out for, especially when a pup, is that they can be injured very, very easily - not just by being picked up roughly or dropped, but by jumping off a chair, or even being stepped on. . They are also known to be shedders. 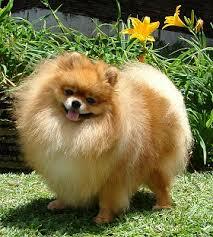 On average the Pom does not tend to be aggressive to other dogs, especially is well bred. However you must make sure that your dog has been well socialized so that it will accept another dog into the home and so important with this breed, is that a bigger dog can so easily injure it, even just in play, so they must be constantly supervised when together. If well bred and well socialized they can be social butterflies, but care has to be taken around bigger dogs who can so easily injure them, even just by playing or lifting a paw and placing it hard on the smaller dog. On average yes, however, as with all dogs, socializing from pup should occur, as well as on-going socialization. If well bred and socialized, Poms normally get on well with children, however, given the fragile bodies, toddlers and young children are not a good idea. All dogs should be socialized from pups with children and this should be ongoing. By the same token, children must be educated on how to approach and interact with dogs and treat them with respect. They should be closely supervised if they are going to pic up such as small dog, especially as the Pom, can wriggle and be easily dropped. Apart from injury, to which they are prone, like many of the toy dogs, they are prone to dental issues and also eye problems. The eye problems include ingrown eyelashes (distichiasis) and entropion, which is where the lower eyelid rolls inwards. They are also prone to Hypoglycemia, Trachea Collapse, Hypothyroidism and Patellar Luxation. Another problem that often develops as they get older is SHLS - Severe Hair Loss Syndrone where the coat starts to thin out. This starts at the back of the thigh and buttocks and moves up the bak - more common in males. There is also a related version that can occur in pups, where the puppy coat sheds, but the adult coat does not grow in. SHLS occurs mainly in males and often becomes apparent later in the dog's life. The dog starts out with a normal appearing coat but the coat slowly thins out, starting at the back of the thighs and buttocks and moving up the back. There is also a puppy-related version in which the puppy coat sheds but the adult coat does not grow.